We co-create with our clients to build their capacity for the future. Our work develops leaders, strengthens relationships and helps organisations, institutions and communities find direction and purpose in complex environments. Our approaches focus on the underlying beliefs and behaviours that can bring about transformational change. Developing the whole-self; leaders who imbued passion, authenticity, a sense of their values and the personal impact to make things happen. Building relationships of trust, openness and collaboration that create remarkable results – between individuals and between organisational units. Navigating complexity and facilitating collaboration to unite communities, organisations and institutions in addressing the great challenges we face. Over the years, our clients have consistently found it helps to explore their challenges – in the leadership, organisational or societal domains – through an integral lens. This deceptively simple framework , adapted from the work of Ken Wilber, provides a map to jointly consider the nature of any situation. The four quadrants draw attention to different perspectives of the context: what is visible (exterior), what is subtle and intangible (interior), the individual and the collective. We see whole people and whole systems and believe the answers to the challenges we face lie already in those systems. 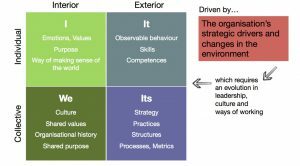 Often our clients’ focus is on tangible pressing problems and issues, for example poor employee engagement scores or a performance crisis (“Its” quadrant) or a request to build capability and skills amongst high-potential leaders or business partners (“It” quadrant). Our view is that the quadrants are interdependent so that, whatever the starting point, we always pay attention simultaneously to all four quadrants. Our most effective work happens when we engage in all dimensions – and navigate them in balance. Collective leadership and collaboration are challenges many of our clients are facing today. We draw on a rich repertoire of processes, such as WorldCafe, Art of Hosting and OpenSpace technology, that we combine for our clients to create conversations, spaces and action that draws on the wisdom and experiences of teams, large groups and whole organisations. In our communication we routinely confuse fact with opinion – especially when it comes to giving feedback. We get clinical with our language and use specific distinctions to help us to more skilfully deliver feedback so that it can be useful, relevant, and grounded for the person receiving it. We see the ability to make skilful assessments as a core leadership ability. This is a tool that looks at how you produce results and satisfaction in an organisation, team or any context that requires coordinating effective action. When applied consistently, it drives high accountability and trust in a team. By viewing activity in terms of this simple cycle, people become more effective in working together by dramatically enhancing their capacity to coordinate action. This is system of organisation that is based on freedom, instead of fear and control. It’s a way of designing organisations to amplify the possibilities of human potential — and the organization as a whole. This social innovation technology articulated by Otto Scharmer at MIT is a powerful roadmap for working with emergent, complex, multi-stakeholder challenges.